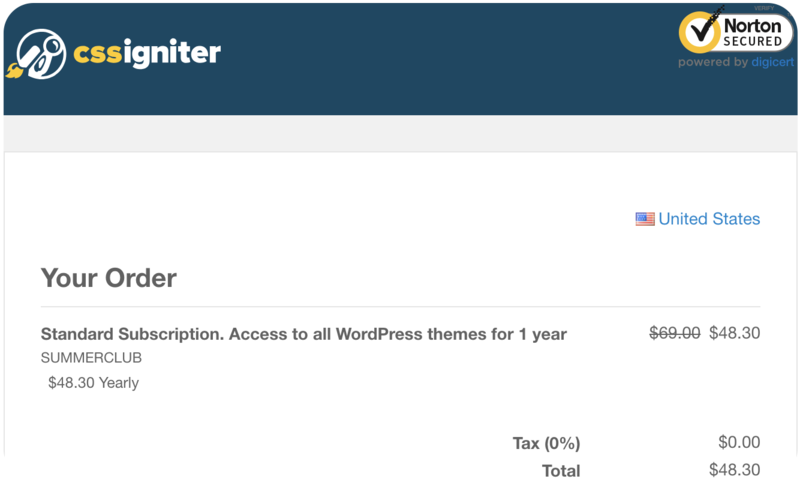 CSSIgniter is a premium WordPress theme club. It gives you a broad variety of beautiful themes to choose from. You can either get a single theme; or join the club and get all their themes, including any new ones added when you are a member. The themes are wide-ranging. Whatever your website is, you will find one that pleases you and makes your website look fantastic. So if you are thinking of taking your foodie blog to the next level, or finally getting started on your freelance writing website, CSSIgniter themes are an excellent investment. Let me give you a breakdown of why CSSIgniter is the missing link in your internet success story. Blogging may not be rocket science, but sometimes it does feel that way, especially when you are a beginner. There are so many things one is expected to remember, to install, and so forth. Is it a wonder then that so many feel frustrated and don’t bother to get beautiful themes for their blog? They don’t think they can do it. It should then come as a relief for you to learn that CSSIgniter themes are exceedingly easy to use. Setting up stuff is not always easy, and can be a real headache if the instructions are not intuitive. Fortunately, setting up CSSIgniter themes is so easy anyone could do it. All you have to do is upload the theme, activate it, and you are done – you can start using it! Installing the theme, uploading its demo content, and activating will take only a short time. It also helps that the themes are intuitive. You don’t have to crack your brain trying to figure out what to do next. As soon as you have activated the theme, you can start using the theme without needing any assistance. Something else that confuses people is when functionalities in a user interface intersect, and it becomes difficult to know which part does which job. The user ends up feeling muddled, and can’t proceed with confidence. That won’t happen with CSSIgniter themes. Their products are designed to solve one problem at a time. Everything is clear-cut. As such, you can work faster since there is no confusion, and you will be more productive. And don’t worry – you don’t have to learn anything new for you to enjoy the easy convenience afforded by CSSIgniter themes to WordPress users. You see, all customization is done using the WordPress Customizer – which, as a WordPress user, you are already familiar with. As a result, all the settings and options in the themes are intuitive, familiar, and easy to use. Since you are using the WordPress customizer, you can immediately view the changes you make – they appear in a live preview window right next to the options panel. With customizing your site being so easy, you can do it often and quickly, experimenting wildly until you discover the look that speaks to you with the greatest clarity. Today it’s a waste of time building a website if you are not going to take Search Engine Optimization into consideration. Search engines like Google and Bing have to crawl through the billions of interconnected websites and documents that make up the World Wide Web. SEO makes it easier for the search engines to “read” what is on your site, and understand its purpose and relevance. So if you run a travel blog, and someone types into the Google or Bing search bar a travel-related keyword, you want your page to be among the top ten that the person receives. And that’s why Search Engine Optimization is so hot today. Every website or blog that wants to remain competitive in the dynamic, disruptive arena that is the internet must ensure that their blog is optimized to cooperate with search engines. CSSIgniter themes are SEO friendly and will help you achieve higher ranks on Yahoo, Bing, Google, and so forth. An SEO friendly theme is half the SEO battle won. Some of the SEO considerations of the CSSIgniter themes include good coding, fast upload speed, social media integration, responsive design, schema markup, and website structure. Thanks to the development of smartphones and other devices of varying screen shapes and sizes, staying connected wherever you are is no longer just a slogan. You don’t have to wait until you get to the office or home to get on the internet. Unfortunately, not all web pages are friendly to these smaller devices. As a result, it can be quite a pain to try and read the website’s content while using a mobile phone. The best websites/themes are mobile optimized. You can easily read the website’s content on your phone. As more and more people access the internet via mobile, responsive websites/themes become even more desirable. Search engines like Google tend to give more consideration to mobile-optimized websites than those which have lower responsiveness. They understand that the best web pages are those that are easy to read on all devices. It’s also worth remembering that mobile devices cause over 50% of all internet traffic. CSSIgniter’s themes have a responsive design that makes it easier for your site’s users to access and enjoy your content while using mobile devices. CSSIgniter gives you three options. The first option will cost you $49, the second $59, and the third $199. The first option has limited functionality, the second option has full functionality for a full year, and the third option has full functionality in perpetuity. Let me illustrate this nicely below. This first theme is known as the Single Theme plan. This one-year deal is known as the Theme Club plan. And for $199, you get all of the above not just for one year or several, but forever! There is no doubt this is the best deal. It is known as the Lifetime Club plan, where you get access to all CSSIgniter themes and plugins forever. One of the greatest nightmares for anyone running a website is the fear of hacking or malware attacks. I can, therefore, understand your concern about the security of the themes you use. The first thing to remember is that you have responsibility for the security of your account. That said, should you note any unauthorized uses of your account, do not hesitate to notify the company at info@cssigniter.com. Once you have sent them your complaint, their support department will confirm that they are working to rectify the issue. To ensure your themes are not vulnerable to malware, always update them as new versions come up. This will take care of any potential security holes which hackers and malicious software might exploit to gain access to your account and cause havoc. As I have just said, updating your CSSIgniter theme is one foolproof way of reducing your website’s vulnerability to cyber attacks. And by the way, I must remind you something. Before you start the update, it’s important to backup your theme, files, and database. In case there are custom changes you have made to your theme files, you will lose them if you don’t have a child theme. So remember to create a child theme before you update the parent theme. Step 1: Go to www.cssigniter.com/download while you are still logged into your account. Clicking the “Download “button will get you the ZIP archive of your theme. Mac users should disable automatic archive extraction before beginning the download. Step 1: First, switch to WordPress’s default theme (or any other theme). Step 2: Delete the theme you want to update. Go to Theme Details, and click the “Delete” button. Any content, options, pages, images, and posts, you have will remain intact; however, all customizations in the theme files will be lost, which is why you should create a child theme. Step 3: Go to Appearance: go to Themes on the dashboard, and click on Add New; and click on Upload Theme. Select the theme’s archive file (zip) on the Choose File button, and click Install Now. Step 4: After successful upload, activate your new theme. If you have a child theme, reactivate the child theme. Step 1: Download an FTP application – for instance, FileZilla. Log into your server via FTP, and go to Wp-Content, and to Themes, and then to Your Theme. Step 2: Delete all the files within your old theme. If it’s a child theme, remove only the parent theme’s files. Step 3: Extract the new theme file from its archive, and upload the contents of the folder by dragging and dropping into the empty folder of your old theme. All the payment plans, even the Single Theme plan are entitled to premium support. You can contact CSSIgniter’s support team whenever you have a problem, and you are guaranteed to receive an answer to your query in at least 24 hours. The company prides itself on quick response and a friendly/helpful support team. CSSIgniter has adopted a forum based support system. The support forum consists of subforums: each dedicated to an individual theme. That means you can do a quick search in the forums and find an answer to your question immediately – if someone else had gone through the same problem, and got the right response. Each CSSIgniter theme comes with detailed documentation so as to make the setup process as easy as possible, should you run into difficulties. They also avail information and tutorial articles on their blog to help you get better at using WordPress or your theme or plugin. CSSIgniter themes are just what you need to take your WordPress blog to the next level. Join the CSSIgniter club and get one year access to all their themes. And if you like what you see, you can take a lifetime membership, and have access to all themes and plugins forever. But if you are simply testing the waters, you can opt to take a single theme, and see how it works out.